Grab some nibbles, pour yourself a drink, and sit down. You’re now ready to immerse yourself in a TV show. And then you notice that CSI Miami is placing Facebook photos of your aunt, uncle, and cousins onto the desk of a perp. Lean forward, and keep your eyes peeled, updates from your Facebook page are about to be incorporated into your favorite TV show’s narrative. (Your best friend becomes the suspect!) As you immerse yourself in the story, the story immerses itself in your social world. In this context, online meets offline and your family and friends will never look the same again! While this opening scenario sounds like pure fantasy, it’s not. It’s actually based on Warner Brother’s Aim High, an upcoming web series that will integrate pictures, music, and information from a viewer’s Facebook page into the video. One might call it the ultimate transmedia vanity blockbuster, where viewers are watching and playing with their own distributed, but connected story fragments. If this trend continues, soon we’ll be interacting with TV and games mashed up with our own social networks on big and small screens everywhere. Since 2003, tools that allow people to easily create, upload, and share personal content are now commonplace. With so many people sharing their lives through networks, there is a social story revolution unfolding. There are more photos taken every two minutes today than during the entire 1800s and, as my Social Media Counter shows, most of this new content is created by individuals who used to be called the audience. Since the late ’90s, the vision of interactive TV has been to meld this viewer-generated content into shows, particularly live TV. Today, we are taking the greatest evolutionary steps in broadcasting since the advent of live TV. In my presentation, “The Gamification of Social TV,” I examine the ways audiences are becoming more and more integrated into media, such as shows, films, games, and live events; first, there is the social level, then the participative, and finally, the inclusive. Real-time conversation about what’s happening on TV has pretty much been with us since the beginning of mass TV in the ’50s. However, nowadays we have advanced well beyond the cord-tethered telethons of yesteryear. Today, advanced technology, like text voting, allows shows to measure the sentiment of the crowd sitting at home, not just the studio audience, in real time. Andy Warhol famously predicted, “In the future, everyone will be world-famous for 15 minutes.” That future has arrived: We can all be stars in our own lifetimes, even if it’s just among our social network. We have become our own entertainment hubs, around which our friends and media circulate. Broadcasters and service providers have caught on to this trend, and now, entertainment-based social networking websites, like GetGlue, allow viewers to check in to movies, TV, and music. These personalized hubs fueled by recommendation and loyalty are allowing viewers to lock their worlds to TV space. Not surprisingly, marketers are also taking notice of the advantages presented by social storytelling. A recent example is the Rommy Gulla Facebook video campaign run by Panasonic Australia. To demonstrate a new Blu-ray recorder’s ability to store 28 full days of HD content, the company developed a Truman Show-esque, promotional Facebook campaign encouraging input and social sharing. Other online services, like Hulu, are also allowing users to bring media directly to their networks and take root inside Facebook itself, creating a forum for friends to share video content seamlessly. At the other end of the spectrum, there are options like Beckinfield Mass Participation TV, which takes social media to the nth degree by inviting users to film themselves as the stars and extend the web show format. This concept borrows from the realm of social alternate reality games, such as a World Without Oil, Truth About Marika, or Conspiracy for Good, which have been allowing users to write themselves into scripts and become the activist hero for quite some time now. Social media storytelling has deep roots in multiplayer role-playing gaming; in fact, the fastest growing game on Facebook at the moment is Sims, the $4 billion franchise game, where players inhabit and merge with social experiences in an alternate character-driven world. Is alternate character acting the future? The film industry is not far behind in embracing social films. Earlier this year, Toshiba, Intel, and their ad agency Pereira & O’Dell took a gamble onInside, an interactive film experiment starring Emmy Rossum directed by D.J. Caruso. Now some people are speculating about whether or not social films are the next big thing in Hollywood. Will we see a social film revolution where plot dilemmas are handed over to the audience to experience and solve? When it is done well, traditional storytelling married to social media is very powerful: It takes those people who want to go beyond a behind-the-scenes DVD extra into the story. While we watch to see if integrated social media entertainment will really take off, there are still some issues to consider, such as, is it invasive for characters from shows to enter an individual’s social networks? and Can a TV blockbuster become too personal? That said, for now, I’m off to watch an episode of House, where I’m the patient! The alarm rings. Get out of bed, have a shower, dress, breakfast, grab your briefcase, and bus ticket and out the door. Now start RUNNING! Zombies are chasing you. Or is it pirates? Or the Mafia? Games and stories have grown legs and Facebook MafiaWars and Playstation console games have jumped into the physical world. Welcome to the most exciting and entertaining commute of your life. For the first time in technological history portable devices that are able to send and receive game/video media, are now location aware. This means big changes in where we experience our stories. They will be always on. Around the next corner. We will be living inside the story world. To get a glimpse of future services in the locative, pervasive space we simply need to look at the now and extrapolate. As kids we all loved playground games: Hide and seek, capture the flag, cowboys and Indians captivated our imaginations and it was an important part of our social development. Today adults use technology to recreate those experiences for real using our own imaginary, place-based Holodecks. Fulfilling some of our adult needs in this space, The Go Game for example advertises itself as “the future of corporate play,” team-building, and self discovery. Beyond mapping, check-in utility, or GPS functionality, what kinds of story game and locative services will get millions off their behinds and out into the real world? It takes a lot to commit to wandering around, scavenger hunting for morsels of story. How in the future may locative gamesevolve into being mass media? Or are they really just for niche groups? This is and has moved way out of niche already. Early locative entertainment, such as orienteering and geocaching (user-created capsules hunt) are still played regularly by five million globally. More story-driven, first-generation Alternate Reality Games with locative elements such as Gentrificationor I Love Bees, attracted several million players. LBS, or locative-based services, have radicallyaltered the social gaming landscape already in Asia for hundreds of millions. A recent Pew mobile report noted that more than half of all smartphones are used for social and utility locative services and by 2015 it will be a $21 billion industry. What makes and will make these so compelling, to so many? This element can put you and your friends at the center of the action. For example, “Spy Am I” a massive multiplayer locative game, lets players be the secret agent, or live the life of a criminal. There are many story based pervasive game apps being launched on GPS enabled smartphones that let you explore your darker side such as Crime is Life or Crime Plays. For those who want to make their real world a little bit more terrifying than it already is we have social locative games such as Zombie Apocalypse, where you have to really run, to outrun the attacking man eaters. Speaking of running, marketers are not far behind in this race with viral examples such as Nike Grid or Mini’s Getaway (“this game has united us, it is so social”) that combined the best formula of story, game, and exercise with lots of social locative strategy. Our locative experience tools are powerful social organizers. Everything in our future lives will be geo-tagged. Set in the physical world means the same tools available to storytellers and marketers are available to everybody, including activists. So the recent Occupy Wall Street meet-ups themselves begin to look like locative fiction. Hundreds of thousands of geo-tagged narratives create probably the world’s most connected locative story yet. In a similar story-world, but oddly similar in focus, Tourality and Shadow Cities get you and your friends to battle, find treasure, and lay claim to areas of the city. Flash mobs are a form of locative storytelling, a sort of organized social Holodeck. The social unification that comes from the best of these choreographed events, beginning with Frozen Grand Central, spread around the world. They become memes copied and extended through global imitation. The story future of this specialized entertainment format is likely to come from expert traditional cinematic and marketing storytellers. They will be experimenting and extending fictional narratives into geo space. Pandemic 1.0 by Lance Weiler & Seize the Media is an infected world extending plot lines and challenges from cinematic games three years earlier. A present day example of future locative story, this played at the Sundance Film Festival and involved the best aspects of team play, discovery, and clever use of multi-device and place. The popularity of locative stories and games will be proportional to marketers and writers making it worth our while to ask for our stories-to-go. As the technology matures and location lock-on is instantaneous, it will truly take off. The technology already fits in with our existing out of home routines, particularly when it comes to commenting, working, eating, and entertainment. But back home, watching a forensic cop show on the TV. At the end, you’re told to go out of the house and help track down the killer on the street, mobile locative device in hand! What are the security implications of this? In one evening, 200,000 viewers turn into 200,000 private eyes on the streets of London?! Would you take part in these types of services? But think, at the end of the day, as the sun sets in a dark backstreet in your hometown, your heart starts pounding again. Will you make it back home alive? How does a country encourage its creative producers to innovate media projects & services? Many leave it to commercial forces only, where it is an innovate or die, sales driven culture. Some though with small or fledgling production communities have to rely on government subsidy and kick-start funding to get most ‘innovative’ projects off the ground. I have looked and been involved in the latter for many years as Multi-Platform producer devising initiatives, director of training units and lecturer in education sectors which include several European countries, Canada, Australia, UK and US. How can we better divvy up millions of tax payers dollars and spread it between heritage and multi-platform? As some of this sails close to one or two of my ‘day jobs’ (some of my credentials in this area are listed at the bottom of the post) I have kept it as generic as possible, without any intentional finger pointing. I hope some top level ideas I suggest to help fix something that has been broken for decades, may not fall on deaf ears. Preface – Traditional Media vs Multi-Platform: Where’s the engagement? To choose an excerpt or ‘why multi-platform’ this old argument about the old vs the new is appropriate here. There are many who say we are in a golden era of TV and Film. Audiences both love and trust these mediums and growth is strong across the board. So naturally “we must find and fund new talent and projects in these areas for the good of our culture”. Telling stories through film, tv, galleries, concert halls and books is the only real media to take into consideration. Or is it? This is the status quo, most public funds for media are for localised film and TV and ‘culturally’ significant ‘art’ projects. The ‘other stuff’ oft called multi-platform or digital or online is still not taken seriously. I suggest it still does not reflect what and how its people are consuming media and how they are engaged in that usage. To give a sense of this disparity, for example in Australia last years total spend (note this includes commercial investment) on film was US $336mill yet overall funds for ‘multi-platform’ creative projects across all public agencies amounted to approx $12-15mill – with the largest funder in the space Screen Australia about to provide approx $4mill annually for creative multi-platform. If we also add TV funding into the mix and think of other territories also (UK film spend US $1.48 bill) we can get to an estimate ratio of around 9:1 of traditional media funding vs multi-platform. Note this is about creative ‘story-centric’ projects vs digital business or hardware enterprise. That means around 9 times more is publicly granted/invested in Film & TV than Multi-Platform or it’s storytelling child, transmedia. I am still adding up figures from other regions which may alter that slightly and although I would like to, don’t get me started on the balance spent on training and education across these two sectors! As I presented in my last post/article (Navigating the World of Multi-Platform) the media landscape has now significantly fragmented from the 1970-90s yet those in control of the ‘funding’ & educational mechanisms are, I would suggest, still basing decision from those days by funding what is effectively just ‘linear video stories’ – vs more interactive across multiple media channels. Sure there are a lot of statistics that on the surface back this up – for example, TV viewing has remained static and even growing regardless of the increase of video watching on the web or games usage and box office is strong even with illegal digital distribution and on and on. But when you look at some sectors, print and music for example, who themselves were saying ‘business as usual’ 2 years ago, it tells a completely different story purely from a sales perspective – due to online distribution (eBooks & mp3 torrents) traditional sales are falling at between 10-30% annually. Another selection of my items cross-posted from another of my original blogs, lamp watercooler. Football Superstars is the world’s first Virtual Football World. An entire online virtual world designed by football fans exclusively for football fans, where you can enjoy a massively multiplayer experience on your PC. Football Superstars is a cross between Second Life, the virtual world game, and traditional football games such as Championship Manager and the Fifa football series. Players can download the game and develop their football skills before participating in full 11-a-side games and, if they become sufficiently skilled, being picked for representative games and eventually international tournaments. Off the pitch, players will be able to socialise and spend their wages in a virtual world of restaurants, bars, clubs and shops. The Nottingham-based startup, has invested more than Â£5m over two years in creating Football Superstars with a team of 80 programmers. Although the game is free to play, players will also be encouraged to spend real money on virtual clothes, boots and cars. All the players on the pitch will be controlled by real players and they will be able to call to one another in real time using headsets and using 3D sound technology. An unlimited number will be able to play at any one time. The game will be another addition to the profitable Massively Multiplayer Online Games (MMOG) market. World of Warcraft, a fantasy virtual game, is the most popular and has almost 11 million paying players worldwide. More than 100,000 people have registered and the company yesterday claimed that new registrations were running at more than 3,000 a day. Games such as FIFA 09, produced by Electronic Arts, have recently introduced online elements that allow players on opposite sides of the world to compete against one another. There have been a few iPhone apps that suggest where things are heading, not necessarily with the iPhone as musical instrument (it is still a small toy) but with musical instruments of the future. The multi touch, inertia driven interface at larger scale is going to be very interesting as well as the proximity and connected element to those around you. I have been using toys like the realistic guitar and various drum machines and percussion effects for over a year now, but do like the new crop of instruments such as the free uFlute and the Ocarina from Smule. The video below shows the ocarina being used in ensemble mode, I am still learning the key combinations to get a decent range on it, but it is starting to feel, musical! Back to my ‘non virtual’ harp, soprano sax, guitars, aftertouch keyboard midi controllers, clarinet etc: yes the real ones! I must say though one of the fantastic features of Ocarina though is the global view ‘lurk’ mode. When I activated this it started to feel a little like the opening of the film contact – a distant globe rotates and around it hovers music from individual players (in countries around the world) who are using the Ocarina in real time, and given the dreamy, reverberant sound it began to feel like humanities call out into the void…quite special. The video I did above captures a sense of it and it reminds me forcibly of Twittervision and the like. Ocarina is the first true musical instrument created for the iPhone. Both experts and beginners will be amazed by this innovative player. Ocarina is sensitive to your breath, touch and movements, making it even more versatile than the original. Unlike other musical applications, there are no pre-compiled riffs so musicians will find unlimited opportunities for self-expression. Advanced options allow you to choose between diatonic, minor and harmonic scales. Or channel your favorite video game adventurer with Smule’s Zeldarian mode. Also, like most Smule products, Ocarina is a social application. Tap on the globe icon and you will see and hear other Ocarina players throughout the world. The globe view will highlight the source of the music. Rate your favorite performances so that others may benefit from your judgment. Name your Ocarina if you want listeners around the world to identify your performances. With this robust application beautiful music is created, appreciated and shared. 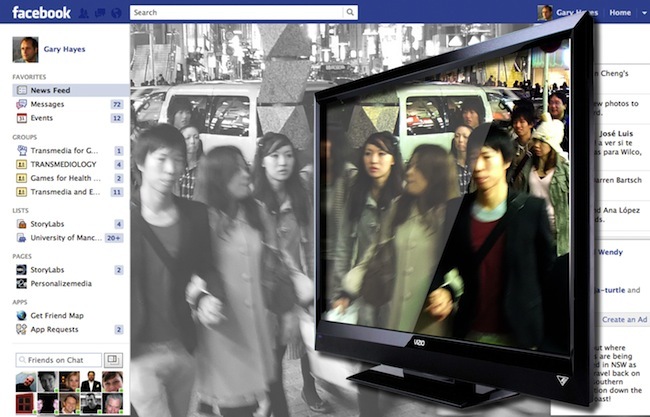 A bit Minority Report Advertising beta 0.9a – Using motion detection on the street in Tokyo to advertise a Swedish Reality TV program called Big in Japan. I love the idea that your motion past a full length ad hoarding causes the image to come to life (well it starts flashing cameras and makes you the star) but that incessant screaming – please! No! It wasn’t clear if actual pictures are taken of the unsuspecting pedestrians, but heh it doesn’t really matter – they were famous for 5 seconds at the local bus shelter. These billboards are equipped with motion detectors and speakers. As people go by they set off crazy japanese fans, cheering and taking pictures of them. But unlike a lot of web-based TV shows, NBC.com‘s offerings use name actors and TV-quality production values. The lineup, co-produced with 60 Frames Entertainment, includes everything from reality competition series to scripted dramas from high-profile writers such as “The Bourne Ultimatum” scribe Scott Burns (comedic drama “Love at First Sight & Other Dangers”) “Oz” creator Tom Fontana (crime drama “Men With Guns: The Assassins”) and “Big Fish” screenwriter John August (quirky comedy “The Remnants”). 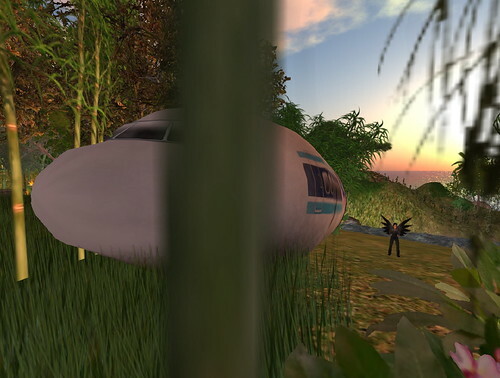 There have been a few TV shows that have offered new and immersive experiences into collaborative virtual worlds notably MTV with Laguna Beach, The Hills, Pimp My Ride and others into There.com as well as CSI and BigBrother (that I wrote about 2 years ago) into Second Life – and lots more. The latest entrant looks far more suited as a match for Second Life, as it more naturally reflects the story environment – being a rather deserted, desert island. As it says in the video about this more experiential extension to LOST – “explore the island by yourself” – “or with other fans” – “find secret places” – “live like a lostie” – “or help the dharma initiative” etc etc: Couldn’t see a lot of story in this build so I suspect created by a small peripheral team? More info at SL Lost.